So I often have [people] who ask what software I use to make my patterns. Adobe Creative Suite -- mostly Illustrator. I use Photoshop for the photo parts and of course, Acrobat to create pdf's. I use to use InDesign to write the main body of the pattern, but after many years, I realized InDesign was not as necessary as I thought. I had taught my sister Ann, of Olive Ann Designs, to use Illustrator when she first started her pattern company, always telling how great it was to use InDesign. Create the main document in InDesign (because InDesign creates multi-page documents like reports, books, etc), create the graphics on single pages in Illustrator, and then just 'place' them in the InDesign doc. If you needed to edit the graphic, Adobe is brilliant in having the edit so easily update itself in both venues. But Creative Suite is expensive, so she found a work-around by just using using Illustrator and never needing InDesign. It was truly one of those, "Why didn't I think of that?" She simply makes lots of art boards in Illustrator and they will print one page after the other like InDesign, something so simple but had never occurred to me!!!! It is nice not having to bounce back and forth between the two. 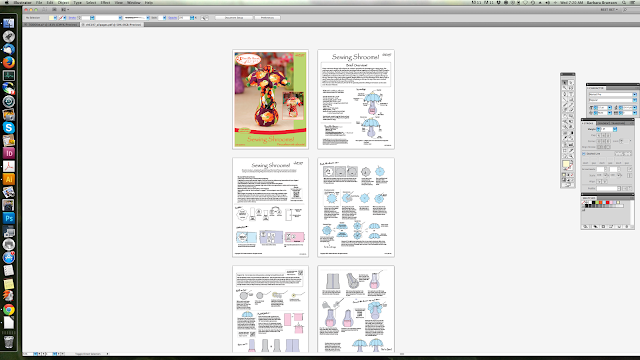 Even though the updating feature between the two is brilliant, you really don't need InDesign when doing up to 12ish page docs because you can just specify up to 12ish art boards. New Printer -- it's a big deal! 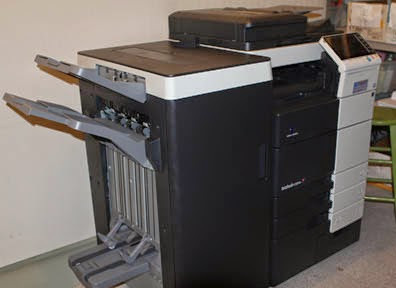 For a small operation like ours, getting a new printer like the one below, is a big deal for sure. It's our third printer of the sort in the last eleven years. And our second Bizhub -- this time a Bizhub 654. It's quite an amazing printer and even though I have to re-adjust every cover for this new printer, the colors are coming out rather great!! Pot Pinchers is now an Epattern! 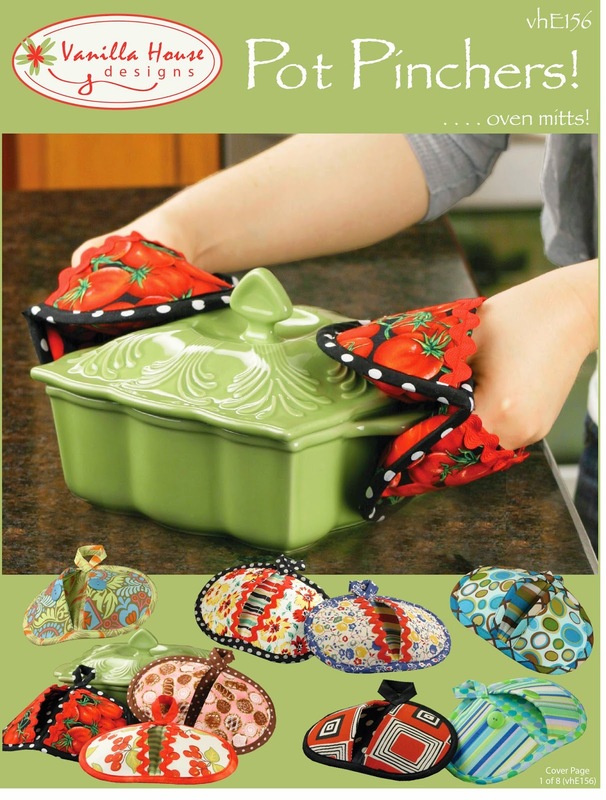 I thought is was time to put up our most famous oven mitt! Hopefully, by the time of this post, we will have just put up vhE156, Pot Pinchers, as an Epattern. I converted it awhile back but will take some time to edit it before it goes up! This is one pattern -- the finished oven mitts -- that I use a lot myself!! Can't live without them!! 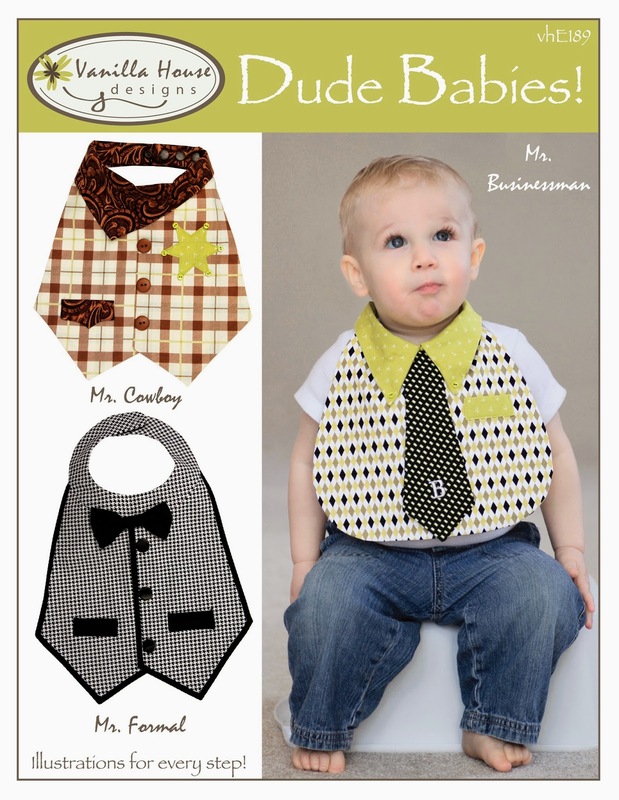 Dude Babies is also available as an Epattern! 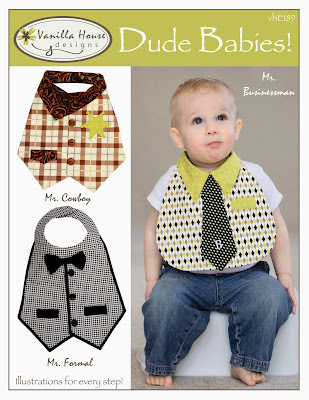 There are three versions in the pattern, Mr. Business Man, Mr. Formal, and Mr. Cowboy! Not sure which one I think is the cutest!